How cute is this Hello Kitty Alarm Clock Radio? I needed a birthday present quick for the hippest 4 year old around (her name is Roxy...Foxy Roxy), so Gerdy and I stopped into Urban Outfitters, which is on the way to the park which is where the party was, and Urban Outfitters allows dogs in their store. There was also a Hello Kitty Toaster, and boy was it cute. It had all the settings - toast, defraud, other important things to do to toast - but I figured it was more fun for adults because what kid should be playing around with a toaster, really. When I arrived at the party, I was pretty sure that I had made the right decision. The spectical of the event was a pink Hello Kitty popup tent, that all the kids loved. Here it is in Amazon, for cheaper! It's $30 at Urban, and $22 at Amazon. I'm seriously going to get it for myself. In this techno age, all I have is an ipod, and I want a radio to work and sometimes not be from my computer. For some reason, getting my hands on a radio has just not been happening. 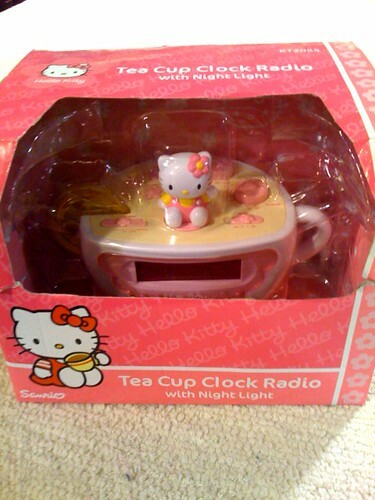 Get the Hello Kitty Tea Cup Clock Radio today, if not for yourself, then for some small child.